NH: I usually wear C – E – G (do – mi – sol) outfits, which is a happy combination. JJM: And what would you wear to a funeral? NH: Since I listen to the colours of food, I only order well-tuned dishes. I can arrange a plate of vegetables that sounds like my favourite song. JJM: Can you eat your favourite song? NH: Totally. Salads contain almost every note. However, it is very hard to find C (do) in edibles, since blue food is basically non-existent. JJM: You are a bit funny, aren’t you? Neil Harbisson introduces himself as the first cyborg ever legally recognized by any Government (2004). He was born colour-blind; so he can only see in black and white (Achromatopsia disorder). An electronic device implanted in his neck allows him to translate colours into sounds. The camera that hangs from his forehead 24/7 was accepted as part of his British passport photo. By that very fact, the camera became congenital and not prosthetic to his body anymore. Thanks to it, light frequencies are captured and translated into sound frequencies by the chip, which in turn sends them to his brain. He literally listens to colours with his electronic eye. A standard eye perceives light, tone and saturation. 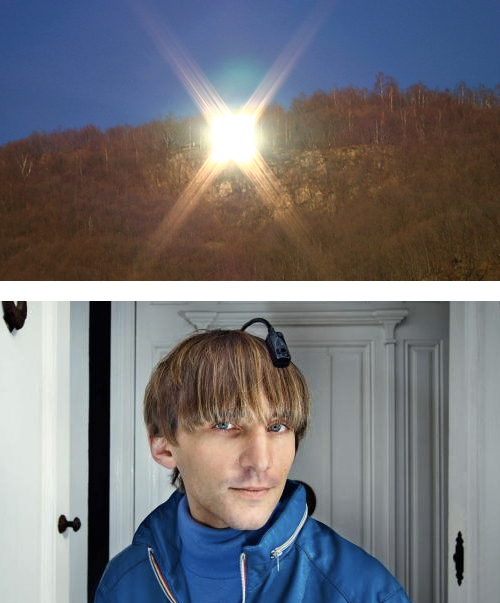 Harbisson’s organic eyes perceive light, but tone is converted into sound, and saturation into volume through his third eye. NH: When I’m done with painting [my apartment], it will become a ‘sonochromatic’ home. I’m not going to decorate it in order to look nice, but to sound nice. In the mezzanine, there will only be black and white, since these colours don’t sound and in the sleeping area you mustn’t listen to anything. It is also very important that the ceiling doesn’t sound. ^ Harbisson’s sonochromatic music scale. Viganella is an Italian village that also got a third eye. 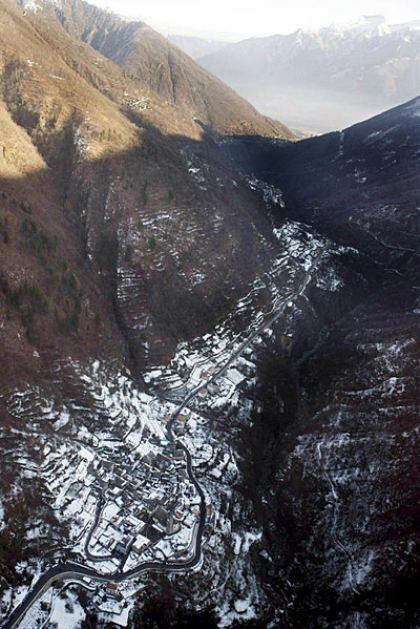 Located in a deep gorge in the Alps, it used to spend almost three months in complete shadow during the severe winter. In 2006, a 40-m2 mirror was installed 500m uphill, in order to reflect sunlight down into the village main square six hours a day. The fact that is about 1 km away results in a lit surface of 16 by 16 metres for inhabitants to enjoy. Harbisson alike, cities can also be able to go over congenital deficiencies through prosthetic add-ons. Dutch photographer Niels Stomps has autopublished a nice book about this village . .
thank you for the link, Sebastian. beautiful pictures!